Just kidding, we didn't get new rules for Ciaphas Cain. 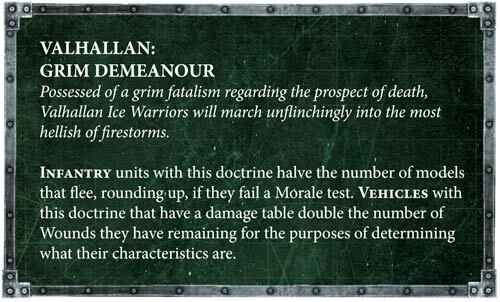 :( But we do have the Regimental Doctrine for the Valhallan Ice Warriors! And guess what? They look really, really cool! Yeah, they look absolutely awesome. Did I see Ciaphas Cain inside there somewhere? With Jurgen next to him? 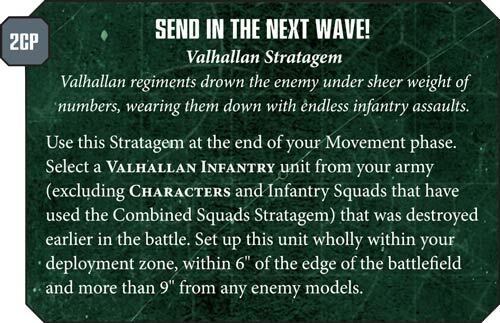 Anyway, with Ciaphas Cain around, we never have to worry about morale in a Valhallan Ice Warriors army. Seriously. In fact, we don't even need Commissars (Ciaphas being an exception). Just look at the Regimental Doctrine. Wow. Not bad. Not bad at all. Like I said, who needs Commissars? But being a tankie (or treadhead) I'm more interested in the vehicle thing. If my Leman Russ tank has say, 4 wounds left, I can double it to 8 and pretend that it's still moving at full speed and shooting at full BS. AWESOME! That image above is the cover for the novel Ice Guard. I should know, I own the novel and absolutely love it. Anyway, the much-awaited nerf to Conscripts have finally come. Doesn't bother me none since I don't really play Infantry and I probably will never touch Conscripts, but just for those of you who do, here are the changes. No more 50 Conscripts. We can only take 20-30 of them. So yay. And unlike the other soldiers, Orders only work for Conscripts on a 4+ (other soldiers, uh, professional Guardsmen automatically pass their Orders), and if they fail, no more Orders will work on them for the rest of the turn. Not bad. Well-deserved nerf. We also have a Valhallan Order. If you can't read it, basically the ordered unit can shoot at enemy units locked in combat with one of your friendly units. So say your conscripts are locked in combat with a Daemon Prince. 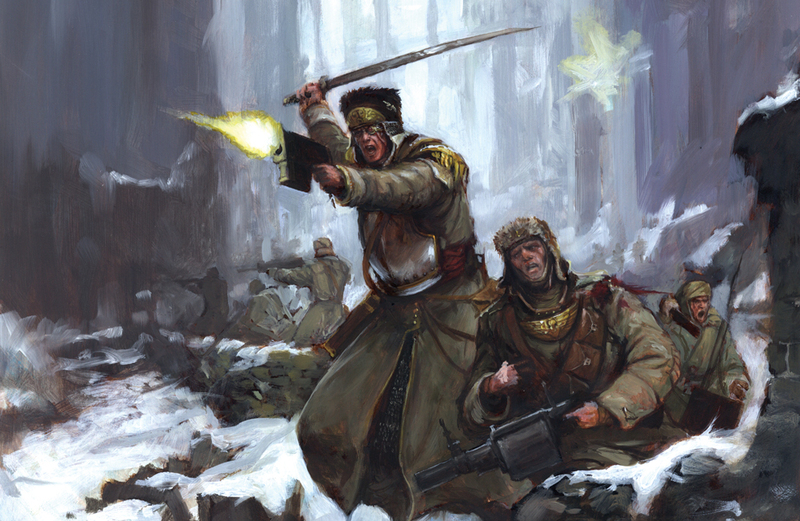 You can order your Veterans to shoot the Daemon Prince even though you didn't have your Conscripts fall back (thanks to that Commissar watching over them). The catch is that, every time you roll a 1 for your hits, your poor Conscripts takes a hit instead. Take note the order cannnot be issued to a unit already locked in combat, so you can't order your Conscripts to fire at the Daemon Prince if they're the ones locked in combat with it. Now assuming your Conscripts just got wiped out by the Daemon Prince because...well, Daemon Prince, you don't have to worry. 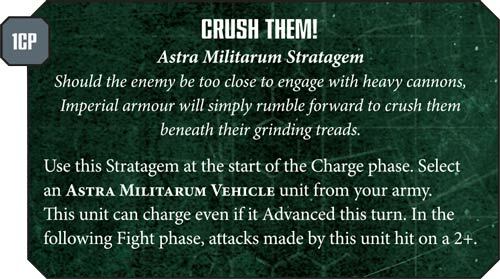 If you have Command Points left over, you can use this Stratagem. Yeah! 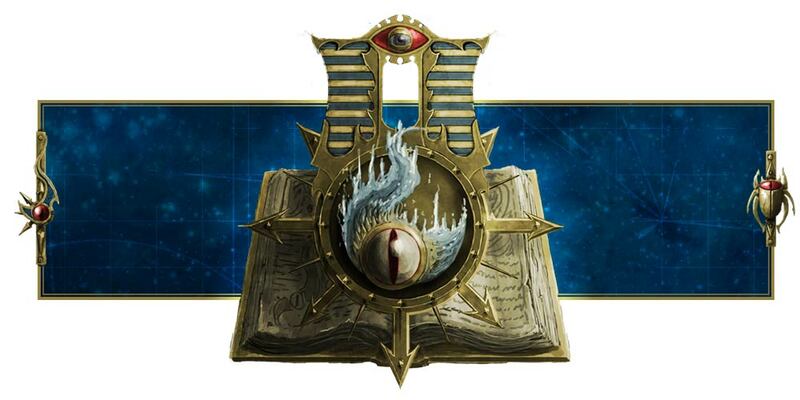 So your Conscripts will return at full strength, marching toward the Daemon Prince once again! This is awesome! Heh. And that's not all. I got even more good news for people like myself who field a Shadowsword or other Baneblade variants. I don't really care about transporting infantry in a Stormlord because, quite frankly, I don't have that many infantry to begin with. What I'm more interested, is this: "the Steel Behemoth rule has been updated so that Baneblades of all types don’t suffer penalties for shooting Heavy weapons after moving." Hell, yeah! Can you say, hell yeah?! HELL YEAH! And if you make it a Valhallan super-heavy tank, then it doesn't matter how much damage it suffers. Your tank will always have double the wounds for its shoot and move characteristics, so even if it's down to 8 health, it counts as 16, which allows you to continue shooting at full BS and moving at full speed! Furthermore, you don't have to worry about the -1 to shooting Heavy weapons after moving anymore, which was always quite the stupid thing I wondered about in the Index. YAY! Oh, and the adamantium tracks on a vehicle with a terrible WS of 5+? Worry no more. We can Crush Them! with our new Stratagem! Yeah, this will be fun. Really fun. I can't stop laughing at how fun this will be. Move and Advance my Shadowsword/Stormsword, crush the enemy in melee with a super-heavy tank of all things, and then unload a lot of stuff with the weapons at point-blank range next turn. Tomorrow will be Armageddon Steel Legion, and I'm looking forward to how Ciaphas's buddy, Yarrick, is faring with his regiment!